Lauded by Pope John Paul II as a model for other post-communist countries, this concordat was drawn up before the new constitution. Thus the Polish legal framework had to conform to the concordat, not vice versa and there could be no constitutional separation of church and state. ♦ For the Polish public among the most contentious points of the concordat is the obligation for the state to provide Catholic religious education (RE) in state schools if requested (Article 12). Law professor Jerzy Wisłocki has expressed doubts about the concordat’s conformity to the new 1997 Constitution. He felt that its Article 12 on catechism in state schools violated the constitutional provisions on religious freedom (Articles 48 and 53). ♦ Another controversial part concerns marriage. Article 10.2 lays down only the “instruction” of the future bride and groom about the indissolubility of Canon Law marriage, but in practice they are obliged to sign a document promising never to divorce. MP Zając noted that Article 10 “may give rise to claims that a marriage concluded under Art. 10 is excluded from the provisions of civil divorce”. For the present the only “civil effects” being claimed for a marriage under the concordat are its legitimacy under civil law, but will the document relinquishing the right to divorce at some point be added to this list of “civil effects”, as has been done right from the start in Article 15.2 of the Dominican concordat? ♦ The notoriously anti-Semitic Radio Marya is protected under Article 21 of this concordat, which exempts church institutions from Poland's fiscal laws. Thus it needn't disclose the source of its funds and doesn't pay taxes. These privileges are given to a radio station whch the Council of Europe has comdemned as “openly inciting to anti-Semitism”  The Vatican has not punished its founder, who continues to run it, the Redemptorist Tadeusz Rydzyk, saying that Father Rydzyk's remarks are his own responsibility. But, of course, it allows him to shelter under its concordat. Concordat between the Holy See and the Republic of Poland. Having taken into account the constitutional principles and laws of the Republic of Poland and the documents of the Second Vatican Council and the Holy See with regard to religious freedom and relations between the Church and society, as well as the norms of Canon Law, [the Republic of Poland and the Holy See] have decided to enter into this present Concordat. The Republic of Poland and the Holy See reaffirm that the State and the Catholic Church are, each in its own domain, independent and autonomous, and that they are fully committed to respecting this principle in all their mutual relations and in co-operating for the promotion of the benefit of humanity and the good of the community. In order to maintain and strengthen the ties between the Contracting Parties and in order to fulfil the mission entrusted to them, an Apostolic Nuncio shall reside, as at present, in the capital of Poland, and an Ambassador Extraordinary and Plenipotentiary to the Holy See shall reside in Rome. The Republic of Poland shall guarantee the Catholic Church and its juridical and physical persons full liberty to contact and communicate with the Holy See, with Bishops’ Conferences, and with particular churches, and also with other communities, institutions, organizations and persons in their own country and abroad. 1. The Repub1ic of Poland recognises the legal status of the Catholic Church. 2. The Republic of Poland also recognises the legal status of all ecclesiastical institutions, land and personnel, who are deemed so according to the norms of Canon Law. The Church authorities shall give due notice of these to the appropriate organs of State. 3. At the request of the Church authorities, other ecclesiastical institutions may also acquire legal status, in accordance with Polish law. Respecting the right to religious freedom, the State shall guarantee the Catholic Church, irrespective of rites, the free and public exercise of its mission, as well as the exercise of its jurisdiction, management and administration of its own affairs, in accordance with Canon Law. 1. The proper competent ecclesiastical authorities shall set up appropriate Church structures; particularly with regard to the establishment, alteration and elimination of ecclesiastical provinces, archdioceses, dioceses, military bishoprics, apostolic administrations, personal and territorial prelacies, territories of abbacies, parishes, monastic institutions and societies dedicated to the apostolic way of life, as well as to other legal ecclesiastical persons. 2. No part of the Polish territory shall be included in a diocese or church province with a seat beyond the borders of the Republic of Poland. 3. No diocese with seat in the Republic of Poland shall extend beyond the borders of the Polish State. 4. A bishop belonging to the Episcopal Conference of Poland shall not belong to a national Episcopal Conference of any other state. 5. A bishop who is not a Polish citizen shall not belong to the Polish Bishops’ Conference, nor shall he exercise jurisdiction within the Republic of Poland, unless exceptionally decreed by legates or other envoys of the Pope. 1. Ecclesiastical offices shall be provided by the competent Church authority in accordance with the provisions of Canon Law. 2. The appointment and removal of bishops resides exclusively with the Holy See. 3. The Holy See shall appoint bishops in Poland from amongst clerics who are Polish citizens. 4. Prior to a public announcement of the appointment of a diocesan bishop, the Holy See shall make known his name in confidence at an opportune time to the Government of the Republic of Poland. All possible steps will be taken to ensure that such a communication is made promptly. 1. The Republic of Poland guarantees the Catholic Church the freedom to conduct religious services in accordance with Article 5 above. 2. The organisation of public services falls within the competence of Church authorities, in accordance with Canon Law and with regard to the relevant Polish laws. 3. The State guarantees the inviolability of places designated by the competent Church authorities, which are designated for religious services and for the burial of the dead and exclusively for that purpose. Exceptionally and with the agreement of the competent Church authorities, such places may be used for other purposes. These provisions shall not restrict the application of Polish law in cases of expropriation in accordance with the provisions of international law. 4. The exercising of public worship in places other than those mentioned in Paragraph 3 shall not require permission from civil authorities unless otherwise determined by the relevant provisions of Polish law, and specifically for reasons of public safety and order. 5. Civil authorities may take precautionary measures necessary in the places referred to in paragraph 3, even without advance reference to ecclesiastical authorities in emergencies for the protection of life, well-being and the public good. (v) 1st November - All Saints’ Day. 2. The above list may be added to through subsequent agreements made between the two Contracting Parties. (iii) the solemnisation of marriage has been registered in civil registers and notice has been served at the State Civil Registry within five days from the solemnisation of the marriage; this time limit may be prolonged, should it not have been observed due to force majeure, until such time as the situation is resolved. 2. Preparation for the celebration of marriage according to Canon Law shall involve instructing the spouses on the indissolubility of Canon Law marriage and on the legal provisions of Polish law concerning the effects of marriage. 3. It is within the exclusive competence of ecclesiastical authorities to make a judgement as to the validity of Canon Law marriage, as well as any other grounds laid down by Canon Law. 4. Passing judgements on matrimonial cases within the limits of Polish legislation falls within the exclusive competence of State civil courts. 5. The question of notification of ajudication referred to in Subsections (ii) and (iii) may be subject to proceedings in accordance with Article 27. The Contracting Parties declare their will to co-operate for the purposes of protecting and respecting the institution of marriage and the family, which are the foundation of society. They stress the value of the family and the Holy See, for its part, reaffirms Catholic doctrine of the dignity and indissolubility of marriage. 1. Recognising parental rights with regard to the religious education of their children, as well as the principles of tolerance, the State shall guarantee that public elementary and secondary schools, and also preschools, managed by civil administrative organisations or independent bodies, shall arrange, in conformity with the desire of interested parties, the teaching of religion within the framework of an appropriate school or preschool curriculum. 2. The curriculum for teaching the Catholic religion, as well as the textbooks used, shall be determined by ecclesiastical authority and shall be made known to the relevant civil authorities. 3. Teachers of religion must have authorisation (missio canonica) from their diocesan bishop. Withdrawal of this authorisation signifies the loss of the right to teach religion. The criteria for this educational training, as well as the form and means of completing the same, shall be the object of agreements made between the competent civil authorities and the Bishops’ Conference of Poland. 4. As far as the content of religious instruction and upbringing are concerned, the teachers of religion must observe the laws and regulations of the Church; in other matters they must obey the norms of civil laws. 5. The Catholic Church shall enjoy the liberty of organizing adult catechesis, including academic ministry. For Catholic children and young people who take part in summer holiday camps, young people’s camps and other forms of collective vacationing, religious practice shall be guaranteed and, in particular, participating in Holy Mass on Sundays and other holy days. 1. The Catholic Church shall have the right to establish and run institutes for the education and bringing-up of children, including preschools and schools of every kind, in accordance with the provisions of Canon Law and according to the principles laid down by the respective civil laws. 2. For the realization of a minimum programme of core subjects and to facilitate the awarding of official certificates, such schools shall be subject to Polish law. However, in implementing a curriculum for other subjects, these schools shall observe ecclesiastical norms. It is for Polish law to determine the public character of these schools and institutes. 3. Teachers, tutors, and other staff, as well as pupils and members of the schools and institutes referred to in Paragraph 1, whether these be public schools or equal to such schools or public institutes, shall enjoy the same rights and entitlements as their public school counterparts and institutes. 4. The schools and institutes mentioned in paragraph 1 shall be subsidised by the State or by territorial autonomous bodies, in accordance with the provisions and criteria laid down by the respective civil laws. 1. The Republic of Poland shall guarantee the Catholic Church the right to establish and freely manage higher educational establishments, including universities, autonomous faculties and higher theological seminaries, as well as scientific research institutes. 2. The legal status of the higher educational establishments mentioned in Paragraph 1, along with the conditions and terms of recognition by the State of degrees and ecclesiastical academic titles, including the legal status of Catholic theological faculties within state universities, are regulated by agreements between the Government of the Republic of Poland and the Episcopal Conference of Poland, with prior approval of the Holy See. 3. The Cracow Papal Academy of Theology and the Catholic University of Lublin shall be subsidised by the State. The State shall also consider providing financial assistance to the autonomous faculties mentioned in paragraph 1. 1. Pastoral care for Catholic soldiers on active military service, including career military staff, shall be provided by the Bishop in Charge of Military Chaplains within the compass of the military bishopric, in accordance with Canon Law and the statutes approved by the Holy See in consultation with the competent authorities of the Republic of Poland. 2. The military personnel referred to in Paragraph 1 shall be guaranteed the opportunity to participate freely in Holy Mass on Sundays and holy mass on Sundays and holy days, provided this does not cause serious impediment to the fulfilment of their official duties. 3. Priests and deacons, as well as members of institutes of monastic life and of associations of apostolic life, who have taken their vows shall be categorised as reservists. For seminarians, those under temporary vows and novitiates, military service shall be deferred in order that they finish their studies. 4. Reservist priests may be called up for military service only for the purpose of training to carry out their function as a military chaplain at the request of a competent superior of the Church. 5. 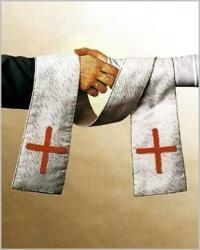 In case of a general mobilization or of a war, the ecclesiastical authorities will nominate additional priests to serve in the military chaplaincy; including deacons, seminarians of higher ecclesiastical institutions and members of monastic institutions and groups of apostolic life to serve in medical corps and civil defence units. 1. The Republic of Poland shall ensure conditions for the exercising of religious practice and for the benefit of religious assistance to persons remanded in prisons, institutions for rehabilitation and for social reintegration, and also to persons in health and social care institutions, and in other establishments of a similar nature. 2. The persons referred to in Paragraph 1 shall be guaranteed in particular the opportunity to participate in Holy Mass on Sundays and holy days, to attend catechism classes and other spiritual retreats, as well as the benefit of individual religious assistance, always within the scope of the conditions of their confinement, as mentioned in Paragraph 1 above. 3. In order to exercise the rights of persons referred to in Paragraph 1, the Diocesan Bishop shall appoint chaplains through whom the respective civil institution shall draw up an appropriate contract. In keeping with the need to guarantee pastoral care to ethnic minorities, it falls to the duty of Diocesan Bishops to determine the organisation of the pastoral ministry and catechizing in a language appropriate to such minorities. The Republic of Poland recognises the right of the faithful to assembly in accordance with Canon Law and within the confines specified there. If such associating through their activities should fall within the scope of Polish legislation, they shall also be subject to such legislation. 1. The Catholic Church shall have the right to print, publish and freely disseminate any publication pertaining to its mission. 2. The Catholic Church shall have the right to possess and make use of all means appropriate for social communication, and also to broadcast programmes over public radio and television, in accordance with norms established by Polish law. 1. The proper ecclesiastical institutions shall have the right, each according to its relevant nature, to carry out missionary, charitable and welfare activities. For these aims, they may set up organisational structures and raise public funds. 2. The provisions within Polish law on public fund-raising shall not apply to the collection of offerings for religious purposes, nor for ecclesiastical, charitable and welfare activities, for research and educational activities, nor for scientific, educative and training purposes, nor for collections made for the upkeep of the clergy and members of religious orders, provided they take places within the limits of churches, chapels and in circumstances defined by customs of a given region and according to traditionally established practice. 1. Activity undertaken by ecclesiastical persons for humanitarian, charitable, welfare, scientific aims, and for upbringing and educational purposes shall enjoy legal parity with activity carried out for similar purposes by civil institutions. 2. In financial matters concerning institutions and ecclesiastical property, including that of the clergy, and having as a starting point Polish legislation and ecclesiastical regulations now in force, the Contracting Parties shall set up a special commission to deal with relevant changes. The new regulation will take into account the needs of the Church given its mission and the practice hitherto of Church life in Poland. 3. The state authorities shall be advised of the ecclesiastical institutions or institutions relevant to the matters mentioned in Paragraph 2. 4. The Republic of Poland shall, whenever possible, provide material support for conservation and restoration work on sacred sites which have value as monuments and the adjacent buildings, as well as for works of art which are part of Polish cultural heritage. Legal ecclesiastical persons may acquire, possess, profit by and dispose of both moveable and immoveable property, as well as acquire and dispose of charges and assets, in accordance with the provisions of Polish law. The Church shall have the right to build, extend, and maintain sacred and ecclesiastical buildings, and also cemeteries, in accordance with the provisions of Polish law. The decision to build a church or establish a cemetery shall be made by the diocesan bishop or a competent ordinary. Competent ecclesiastical authorities shall proceed with the construction of ecclesiastical and sacred buildings and the establishment of cemeteries after having agreed upon a site with the competent authorities and having obtained the necessary administrative authorisation. 1. In each diocese a special commission appointed by the diocesan bishop shall co-operate with the competent state authorities in order to protect property of cultural and national value, as well as archived documents and documents of historical or artistic value kept in sacred and ecclesiastical buildings. 2. Competent State authorities and the Episcopal Conference of Poland shall draw up regulations for accessibility to property of cultural value which remains in the possession of or is administered by the Church. Ecclesiastical juridical persons have the right to establish foundations, which shall be subject to Polish legislation. Matters requiring new or additional solutions shall be regulated by means of new agreements between the Contracting Parties or by understandings between the Government of the Republic of Poland and the Episcopal Conference of Poland with the prior authorization of the Holy See. The Contracting Parties shall try to resolve through diplomatic channels any prospective divergences of interpretation or application of the provisions made in this current Concordat. This current Concordat shall be subject to ratification. It shall come into force after one month from the date of exchange of the ratified documents. This Concordat was drawn up in Warsaw the 28th day of July 1993 in duplicate, original copies each in Polish and Italian; both texts are equally authentic. In witness whereof the Plenipotentiaries of the Contracting Parties have undersigned this Concordat and have affixed their own seals to it. Titular Archbiship of Eraclea, Apostolic Nuncio.